The information contained in this Web site is intended as an introduction to the products and services offered by Heartland Mutual Insurance Association (HMIA). It is not intended to replace direct, personal communication between HMIA and those that we insure. Nor is it intended to replace direct, personal communication between HMIA and its authorized agents. While care has been taken to present accurate and up-to-date information in this Web site, neither HMIA nor NAMIC Web Services may be held responsible for errors, omissions and/or inaccuracies that may be contained in this site. Nor may HMIA or NAMIC Web Services be held liable for damages or losses that results either directly or indirectly from the use of information presented here. 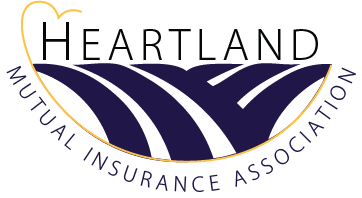 We urge all concerned parties to verify the information contained herein by personal contact with Heartland Mutual Insurance Association or one of its authorized agents before making decisions regarding their insurance needs. This website contains links to other sites maintained by third parties. Heartland Mutual Insurance or NAMIC Web Services does not operate or control any information, products or services on such third-party sites and does not guarantee that the links or any information contained thereon will be accurate at the time of your access. Third party links are included solely for the convenience of users, and do not constitute any endorsement, approval or certification by Heartland Mutual Insurance , its affiliates and/or its suppliers of the content of any site referenced by a link or otherwise. Various state and federal regulations requires us to protect your “nonpublic, personal information” and to advise our customers on how we collect and share this information within our company and with external third parties. “Nonpublic personal information” refers to any individually identifiable information gathered by us that would not be available to the general public. Heartland Mutual Insurance Company values your privacy. Your personal information is only used when appropriate, to provide you with the best possible service, products, and opportunities. When you first become a policyholder, and at least annually, we will provide customers who have a continuing relationship with Heartland Mutual Insurance a notice that indicates our privacy practices. Customer information is not sold. We do not provide customer information to any person or organization not affiliated directly with Heartland Mutual Insurance. Persons or organizations acting on our behalf are also required to protect your confidentiality. We thank you for choosing Heartland Mutual Insurance Company. We appreciate having the opportunity to do business with you. Please call (515) 295-7247 if you have any questions regarding this notice. © 2019 Heartland Mutual Insurance Association.